Would you like to look as young on the outside as you feel on the inside? Dr. Moelleken’s unique and innovative facelift procedures can help you achieve that goal. Your facial appearance is how you present yourself to the world. Moreover, it is the first thing you see when you look in the mirror and the first thing people look at when they meet you. In fact, it is the focal point of all your interactions with the outside world. Would you like to learn more about anti-aging and your facelift Beverly Hills options? Your face is the one part of your body that you can’t disguise imperfections. This may be despite your best attempts to do so. With that in mind, how much money do you think you spend on skin creams and cosmetics? People spend thousands each year purchasing these items to conceal their flaws. No matter how well you take care of your skin you cannot stop the aging process. Gravity, sun exposure, aging, stress, and the environment all take their toll on your face. In this case, it is at the expense of your self-esteem and confidence. Why does our face age? As you get older, your skin goes through a series of changes. Cells divide much slower and your dermis, or lower layer of skin, gets thinner. To further explain, elastin and collagen tissues compose your dermis. Elastin gives your skin its elasticity and collagen keeps your skin taut. With time, these proteins break down, causing your skin to loosen. This makes it more susceptible to the effects of gravity. Additionally, the muscles and tissue under your skin begin to change. For example, this leads to the appearance of lines and wrinkles on your face. Do you want to correct the damage done by time and gravity? Are you tired of looking in the mirror and seeing the loose skin and muscle? Are your cheeks and jowls drooping? Is your brow or neck, wrinkled? If you answered yes to any of these, please contact Moelleken Plastic Surgery. 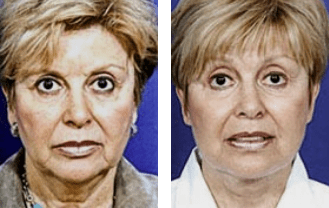 You can correct the signs of aging by scheduling a facelift Beverly Hills consult. Call us today for an individualized treatment plan. You won’t regret it. Best explained, a facelift tightens the skin at various points on the face. In other words, a facelift readjusts the deep tissues and muscles underneath the skin. Because of this it eliminates wrinkles and gives you a more youthful appearance. Dr. Moelleken’s innovative procedures are superior to traditional methods in several critical ways. First, Dr. Moelleken considers the contours of every individual face. By doing this, it helps him to decide where to make the incisions. The goal is to rule out visible scarring after surgery. By making incisions in front of the ears, Dr. Moelleken avoids this problem. Employing this advanced anchoring technique ensures that the ears remain unaltered. As a result, the shape of the face remains unchanged. Second, Dr. Moelleken’s breakthrough techniques lessen the risk of damage to facial nerves. This can be a potential complication of facelift surgery. Some physicians do not have proper training in microsurgery. Thus, also lacking a thorough knowledge of facial nerve anatomy. Unfortunately, another common side effect of facelift surgery is the “pulled, plastic look”. Exactly how does Dr. Moelleken avoid giving you an artificial appearance? The answer is simple. A facelift is best combined with a few procedures. Ancillary procedures give more natural, artistic, and harmonious results. There are many different ancillary procedures that complement the facelift. Using a combination of varied procedures works to rejuvenate the entire face. As a result, these procedures give harmony and balance to your other facial features. In other words, this is a less traditional approach to face, brow, and eye lifts in 2019. Fat grafting to hollow facial areas and lips. Because the patient is requesting the surgeon to improve on several aspects of his or her face. There are several kinds of techniques in doing so. Most of these methods involve incisions and trimming of excess skin and tissue. The hairline and natural creases of the skin are the ideal places for incisions. Depending on the individual case, the procedure may last for several hours. This may also happen if more than one procedure is taking place. The procedure itself entails separating the skin from the fat and tissues under it. The surgeon will then trim off excess skin, fat, and tissues in order to get a new shape or contour of the face. Usually, the chin and the jowls are the primary places where excess skin and fat may occur. Below and above the eyes are also possible places where these may accumulate. Pain and discomfort are common complaints when recovering from a facelift. Some patients need a prescription for pain medication. This eases the discomfort from the facelift. A degree of numbness may be present from the time after the surgery and up to several days. Numbness may last up to two weeks. Some swelling may occur, but this will go down after several days. Bruising may also occur, but this should be minimal and heal within 2 weeks. It is important to ask Dr. Moelleken where you should place an ice pack after surgery. How and where you apply the ice will aid in healing. 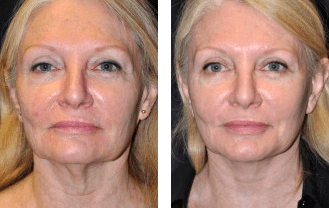 Do you want dramatic and long lasting facelift Beverly Hills results? With something as valuable as your face, it is critical to place it in the hands of experience. Dr. Brent Moelleken is a skilled and expert facial plastic surgeon. He is board certified by the American Board of Surgery and the American Board of Plastic Surgery. Lastly, he is a Clinical Associate Professor of Surgery at UCLA. Experience and training are critical to excellent facelift results. Dr. Moelleken has a well-qualified staff at his plastic surgery practices. We have 2 offices in Beverly Hills and Santa Barbara. Our offices are now better able to serve your plastic and reconstructive surgery needs. Please know, we understand that every face is unique and every perception of beauty is different. Do you want a facial plastic surgeon who will listen to your concerns? Have you been searching for a plastic surgeon that will answer your questions about facial aging? Moelleken Plastic Surgery wants you to feel more attractive, confident, and youthful. How does this all begin? First, you need to schedule a consultation with our office. Your facelift consultation is the next step in your journey. Start today and let Dr. Moelleken to create a customized surgical plan designed only for you.